Coach Salisu Yusuf celebrates with Anthony Okpotu during the WAFU Tournament in Ghana last year. The team will face Libya today in a match they need to win to stay in contention at the CHAN competition in Morocco. 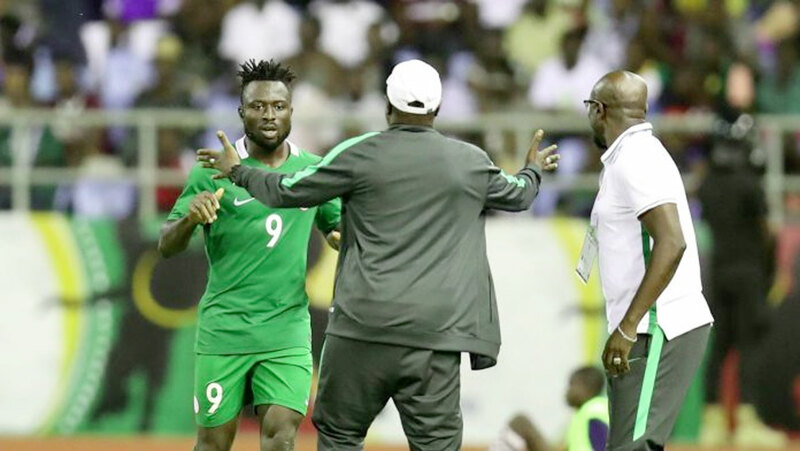 Home-based Super Eagles yesterday resurrected their hope of qualifying from Group C at the on-going African Nations Championship (Chan), beating the defending champions, Libya 1-0. The match played at the Stade Ibn Batouta in Tangier, saw the Nigerians scoring in the 78th minutes through Adeyemi Faleye, who fired home Emeka Atuloma’s corner-kick with the Libya defence caught ball watching in their own box. The Mediterranean Knights began the tournament with a 3-0 victory over Equatorial Guinea at the same venue on Monday to jump to the top of the group, while the Eagles played 0-0 with Rwanda. But the victory yesterday catapulted Nigeria to the top of the group with four points from two matches. Nigeria’s last group match is against Equatorial Guinea. The Super Eagles threatened first just three minutes into the game when a long throw into Libya’s box found Stephen Eze, who flicked it, but Anthony Okpotu failed to get a touch to tap it in. Osas Okoro then played a dangerous curling cross into the Libya box in the 21st minute and Masaud Sand made a crucial clearance as Nigeria continued to press the Mediterranean Knights. After a scoreless first half, the Nigerian coach Salisu Yusuf made some changes, bringing out Anthony Okpotu for Ibrahim Mustapha in the 60th minutes, while Ifeanyi Ifeanyi was replaced by Ekundayo Solomon Ojo in 73rd minutes. It added some bites to the attack.